VANCOUVER, British Columbia, Oct. 16, 2018 (GLOBE NEWSWIRE) -- Triumph Gold Corp., (TSX-V: TIG) (OTCMKTS: TIGCF) (“Triumph Gold” or the “Company”) is pleased to announce that the 2018 exploration season, on the company’s 100% owned, road accessible, Freegold Mountain property, which began in late March, is now complete. In addition to making numerous long, high-grade and gold-rich drill intersections during the 2018 season (summarized below) two new, at surface, mineral showings were discovered, the Drone Zone showing, and the Maximus II showing. 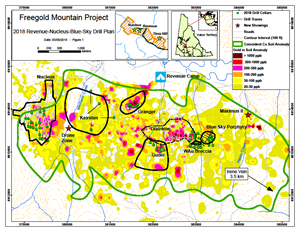 Two new gold (Au) - copper (Cu), (zinc-lead) (Zn-Pb) showings have been discovered on the Freegold Mountain property. Both showings were discovered as a result of local placer mining operations where surficial deposits of gravel were removed exposing previously buried mineralized bedrock (Figure 1).